What’s better than ziplining? 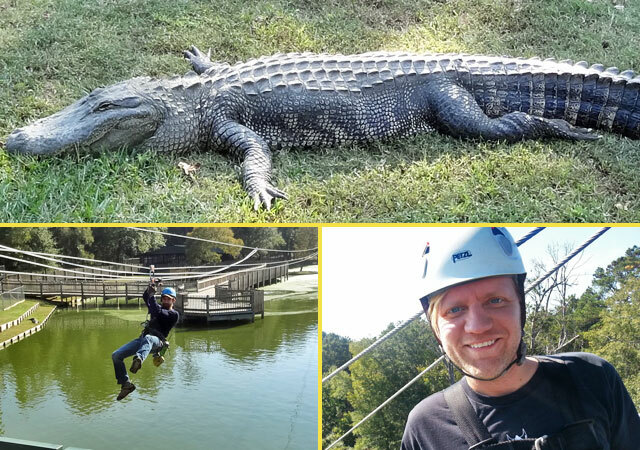 Try ziplining while hungry gators circle underneath, nipping at your heels as you zoom past, waiting to devour anyone who falls! 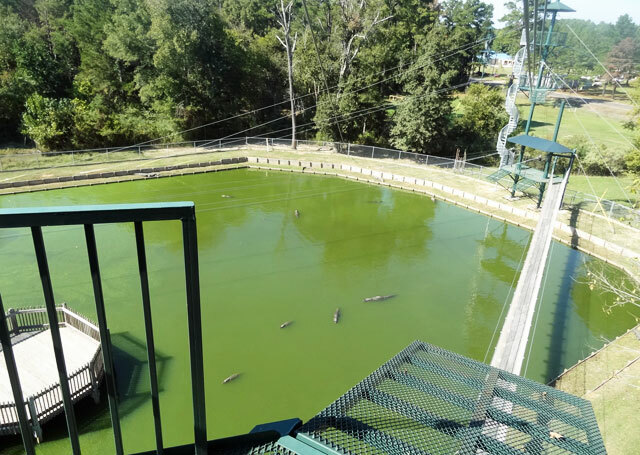 Ok, gator ziplining isn’t quite that extreme – the harnesses are secure and the cables are far enough off the ground that no one’s going to lose any limbs. And most of the sunbathing gators couldn’t care less about the excited humans whizzing by overhead. 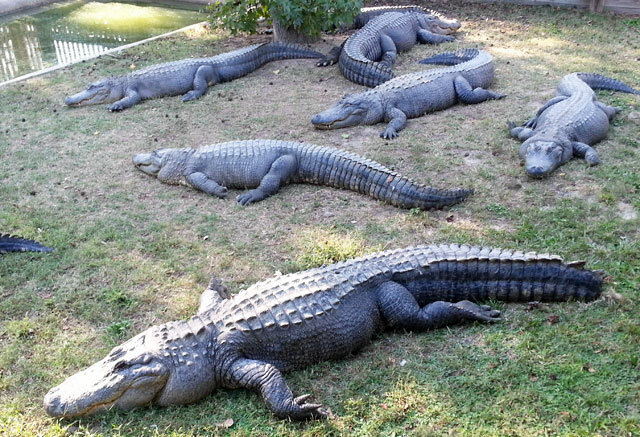 Still, the presence of the sharp-toothed reptiles at Gator and Friends Alligator Park in Greenwood, Louisiana definitely ramps up the adrenaline factor. 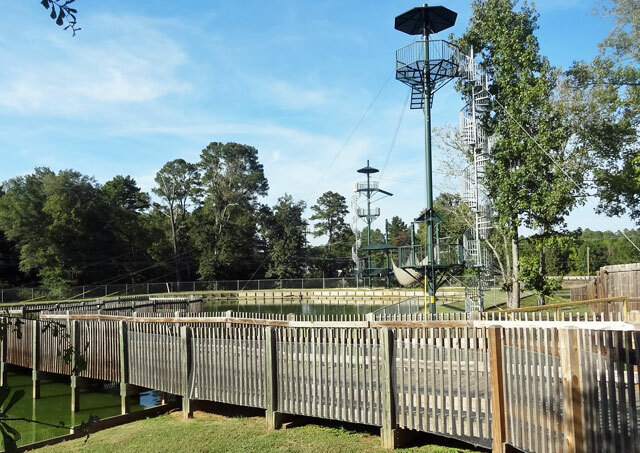 The first of the seven zipline runs at Gator and Friends is the shortest, so in one respect it’s a good way for those with cold feet to ease into things. But it also goes right over the swimming gators, providing a double-dose of terror, or exhilaration, depending on your perspective. 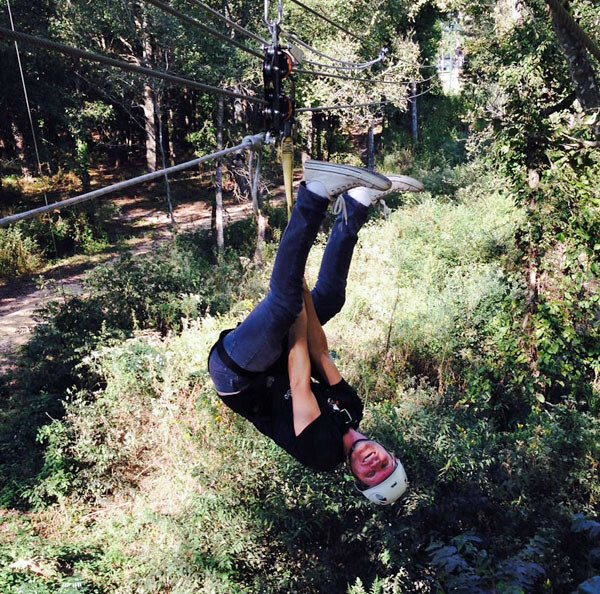 This was my first time ziplining, so initially I stayed in the seated position, but as I grew more comfortable and picked up some tips and encouragement from the guides, I ended up zipping upside-down on a couple runs. There’s nothing like the freedom of hanging and spinning 40 feet in the air! The lines gradually get higher and longer. Some go through the woods, and other pass over the animal farm portion of the complex. 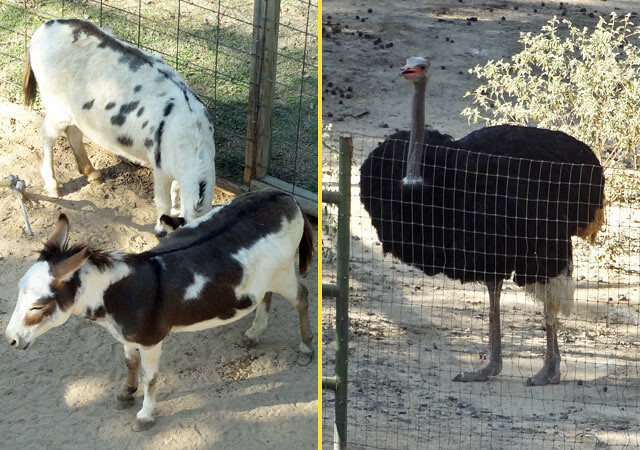 The “and Friends” part of the establishment refers to the animal park that includes camels, ostriches, donkeys, zebras, and even the occasional zonkey. If you ever want to see a bewildered donkey, race past on a zipline 20 feet above its head. 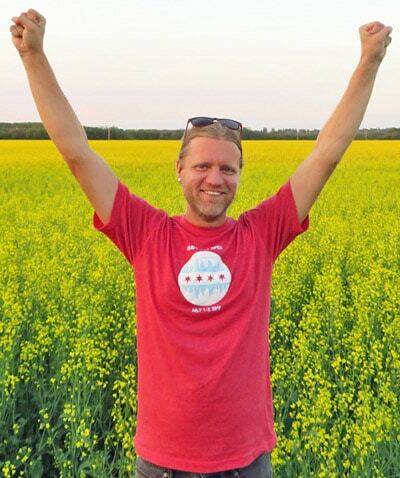 The whole operation feels very reliable, thanks to safety-conscious guides and sturdy equipment. The staircases sway slightly from side to side as you walk up, which is by design – being flexible keeps them from cracking. The slight wobble, while somewhat intimidating, is a safety precaution. 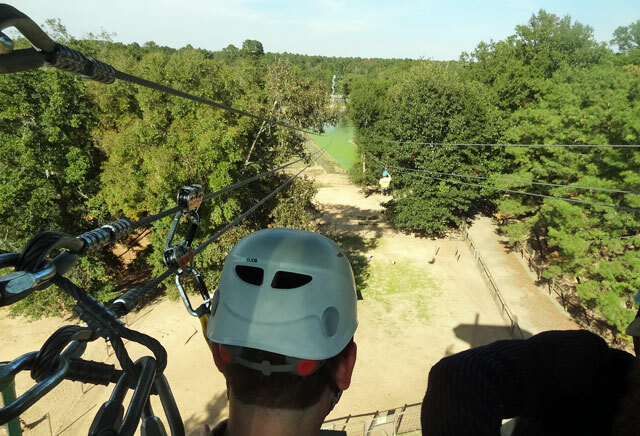 Here’s the view from the final zipline tower, which begins in the animal farm and proceeds across the long gator swamp. Once the zipping was done, I had a chance to check out some of the alligators sitting around near the main office. These suckers are massive. Way bigger than the wild ones in the Everglades! My only complaint about gator ziplining is that it may have ruined me for all future ziplining excursions. Zipping through some random patch of woods just isn’t going to be as thrilling without the theoretical possibility that I could be eaten alive by eager carnivores should something go wrong. 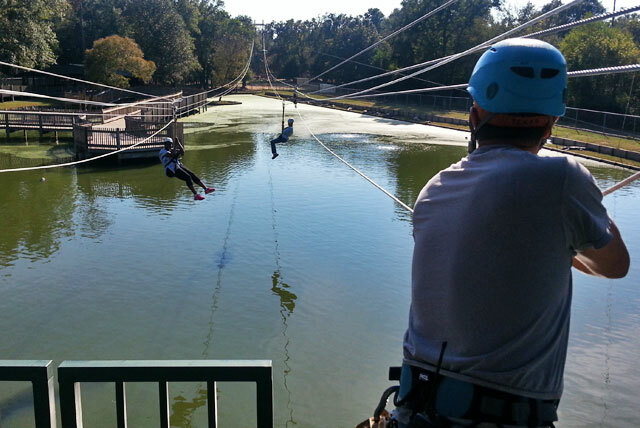 Gator ziplining is about as good as it gets. Unless, of course, someone invents shark ziplining. There you go, entrepreneurs of the world. You have your next assignment. My visit to Gator and Friends was made possible by the Shreveport-Bossier Tourist Bureau. As always, all thoughts and opinions are my own. I went to school in New Orleans, and every once in a while a gator would be hanging out in the canal where we had rowing practice. I could never get used to them, but it was great motivation to row really, really fast. 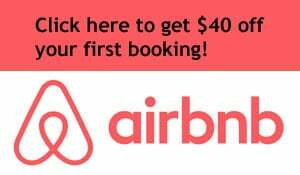 Wow, that would be freaky! And definitely motivating to pick up the speed. Send him! It’s a good time and I love the novelty factor, too. I’ve never seen When Vacations Attack but it sounds entertaining – I’ll have to seek it out!